In 969 a conflict between the Byzantine Empire and the state of Kiev occurred. During the most severe conflicts between the Bulgarians, Byzantine and Russians, the Bulgarian Czar Peter died. His death in Macedonia was used as an excuse to start-up for a liberation resurrection. From the very beginning of the uprising incited by the sons of a Slav prince Nikola: David, Moses, Aaron and Samuel, the town of Ohrid and its surroundings were in the very center of the tumults. The uprising started in 969 and quickly stretched out throughout the territory of the former “Sklavinia” (province) Berzitia. This territory and other neighboring regions were freed from the Bulgarian rule. The former Macedonian “sclavinias” (provinces) were united into a Macedonian Slavic state known as Samuel’s Empire. Although still under the supreme rule of the Byzantine emperor, in the period from 971 to 976 princes David, Aaron, Moses and Samuel managed to gain international recognition for their state. Later, as a monarch, Samuel managed to develop a large army and well-trained soldiers so that by the end of X century the Macedonian state (Thessalonika excluded) was also covering the territories of Bulgaria, Serbia, Greece, Albania and Croatia. After obtaining the Pope’s blessing, Samuel promoted the Macedonian Church to the rank of a patriarchate. Ohrid then became the ecclesiastical and czaristic center of the Macedonian State and grew into a true medieval metropolis. The town consisted of two territorially adjoining parts: the fortress, i.e., acropolis, and lower town. These two sections formed the entire urban dwelling at that time known as polis. In the fall of 1015 the Byzantine emperor Vasileus II succeeded in seizing Ohrid. The fortress, however, remained in the hands of Czar Jovan Vladislav, the heir of Gavrilo Radomir, son of Czar Samuel. After the assassination of Jovan Vladislav in the spring of 1018, the Macedonian State ceased to exist. In a 1073 record it is written that the town of Ohrid was in ruins. Vasileus II who was afraid that the Macedonian palaces might become a large center of uprisings carried out this devastation. Emperor Vasileus II believed that his subjects would be obedient if the Church was involved. Thus, he allowed for Ohrid to remain the centre of the Ohrid Archiepiscopate. The Ohrid Church became a tool of the Byzantine Empire for maintaining their rule over the Macedonians. During the reign of Vasileus II Ohrid Archiepiscopate consisted of 32 eparchies. At the end of XI century the number of eparchies was reduced to 26. One of the church superiors – Archibishop Leo was involved in the reconstruction and decoration with frescoes of the cathedral church of Saint Sofia. In the middle of 1081 the Byzantine Empire entered into war with the Norman. This created conditions for overthrowing the rule of the Byzantine Empire in Macedonia. However, the Norman stayed in Macedonia, in Ohrid, until 1085, when they retreated from the Balkans. 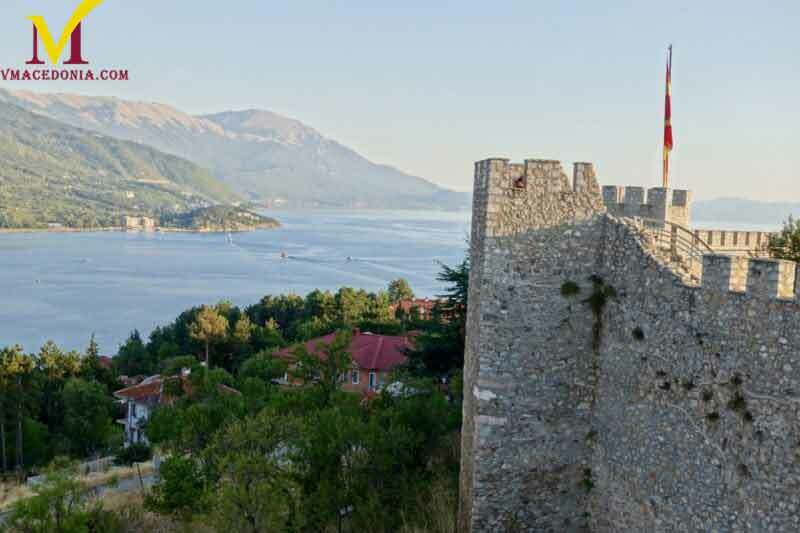 There is lengthy and broad narration about Ohrid from this period written by the geographer Idrisi, one of the many erudites from the royal court of Palermo. According to Idrisis’s “Geography” written in 1153, Ohrid was situated on Via Egnatia, on a six-day journey distance from Durres (Albanian port). Besides the ancient road Via Egnatia, also the road linking Durres-Skopje-Strumica-Melnik-Serez-Orfano passed through Ohrid, as well as other main and local roads. In XII century in Macedonia, in particular in the Ohrid region, the Bogomilism (dualistic-Manichaean religious sect) was widely expanding. After the withdrawal of the Norman, when the people’s movement against the Byzantine rule gained power, the actions of the Bogomils were particularly strong in the Ohrid region. Also the Archbishop Theophylus of Ohrid wrote about the shape and the life in Ohrid at the end of XI and during XII century. He wrote that in that period Ohrid was a large town whose inhabitants were the local people of Macedonian origin. The cathedral church of Saint Sofia was located in the fortified part of the town. In this church the Archbishop Theophylus carried out his religious services. He wrote that the citizens of Ohrid listened to his service “as the donkey would listen to the lyre”. This was due to the fact that the service was in Greek. The same Archbishop wrote that in that period Venice and other Italian towns influenced all aspects of the development in Ohrid. Also, another rare record of the existence of “Municipal Council” was preserved for Ohrid. This Council was responsible for maintaining order in the town. Even the Archbishop was accountable for his activities to that Council. For the needs of the Churches within the Ohrid Literary school, and also later during XV century, numerous books devoted to religious service were written. A great number of manuscripts were taken from Ohrid to Bologna, Moscow, Sofia, Belgrade, Zagreb, Prague, and other centres. Among them was the renowned Bologna Psalter – an important Macedonian manuscript. Today this literary work is kept in Bologna (Italy) and it bears the name by this city. The Bologna Psalter contains 264 papyrus sheets. It was written by Beloslav, Josif and Tihota, literates from the village of Ramne, Ohrid region, in the period between 1230-1242. In those days manuscripts were usually written by hand on papyrus, and lavishly ornamented and gilded. It is said that the Bologna Psalter is one of the most magnificent Slavic manuscripts from XIII century. It was edited in Macedonian, and its orthography is characteristic for the Ohrid Literature School. In 1202 the Byzantine Empire faced the attacks of the IV expedition of the Crusaders. On 13th April 1204 the Crusaders seized Constantinople and this date marked the end of the Byzantine Empire. It was replaced by formation of the New Latin Empire. In the same year Latin rule was established in Macedonia, when the region of Ohrid, alongside with other southwest Macedonian territories, became a part of the Latin kingdom of Thessalonika. In 1219 an event of importance to the Ohrid Archiepiscopy occurred. The patriarch of Nikkeia, Manuel, confronted the newly established Serbian autocephalous Archiepiscopate as a counterpoise to the Ohrid Archiepiscopate. When the Serbian Church became independent, the Ohrid Archiepiscopate lost its eparchies Raska, Prizren, Liplan and Srem. In 1272 a Byzantine emperor issued a proclamation granting the Ohrid Archbishop the right to reinstate the eparchies taken by the Serbian and Bulgarian Churches. In 1274 in Lion a treaty on Church Union between Rome and Constantinople was signed. On that occasion Serbia and Zagora were highly criticized for proclaiming autocephality without the consent of the Roman Archpriest. In 1334 the Serbian king Dusan, using the enflamed internal struggles for power in Byzantine Empire managed to break the Byzantine line of defence in Macedonia and Albania, taking possession of a number of cities. The cities of Ohrid, Prilep and Strumica fell under the rule of Serbia. During the 7th decade of XIV century administrator of the Ohrid parish was Andrej Gropa. During his rule, in 1378, the church of St. Bogorodica Perivlepta (St. Clement) was added onto. There is an inscription about that in the church. Progon Zgur founded the church itself in 1295. At the end of XIV century the Turkish sultan Bayazit I managed to impose his rule throughout Macedonia. It was possible, according to certain assumptions, that the Ohrid feudal principality maintained its independence till the end of the century, certainly under the supreme rule of the sultan.